2. Refine your results by selecting the 'Resource Type' 'Finders Thesis'. This will produce a complete list of all theses held in the Thesis Collection for that discipline. Sort the list by Date - Newest to see most recent theses first. Check the discipline/department names tab to find what terms may have been used to index theses . Discipline and department names often change, and the most recent names can be found on the University website. Note that earlier theses in your discipline may use an earlier form of the discipline or department's name. Please be aware that theses from some departments may cross discipline boundaries so it may be preferable to do a subject keyword search, including the words 'flinders' and 'thesis' if satisfactory results are not found using the discipline search. Many theses are available online. You can find digital theses at the link below. From 2014 the submission of research higher degree digital theses have become mandatory. Using Trove, you can search the catalogues of all Australian university libraries simultaneously - this will include details of all theses available in library collections and digital repositories. A collection of dissertations and theses offering full text for graduate works added since 1997, along with selected full text for works written prior to 1997. WorldCat is a US-based, international network of libraries and services. 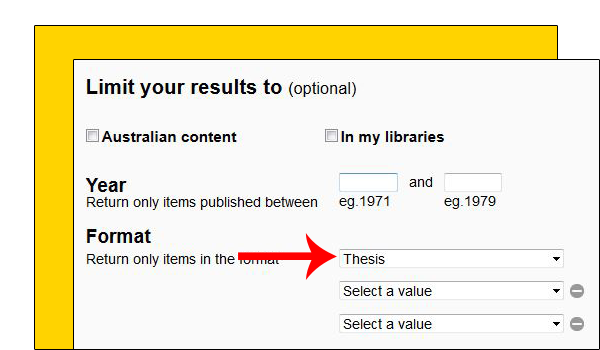 Limit results of a search by selecting Dissertation/Thesis in the content box. Very occasionally there will be a link to an online abstract or copy of the thesis. Occasionally theses theses are freely available to download; you have to register to do this. This is a huge repository of theses, but it is very expensive to source the full text. DAI Abstracts for a variety of subject areas are also available online via the following subscription databases (mostly on the OVID or CSA Illumina platforms.) It is usually a case of limiting a keyword or subject search to a dissertation publication type or source. Covers educational-related literature from journal articles, conferences, meetings, government documents, theses, dissertations, reports, audiovisual media, bibliographies, directories, books and monographs. Includes adult, career & vocational education, counselling & personnel services, early childhood education, education management, handicapped & gifted children. Coverage: 1966-present . Database is sponsored by the U.S. Department of Education to provide extensive access to education-related literature. ASFA - Aquatic Sciences and Fisheries Abstracts Description of this database. Provides extensive coverage of research on aquatic organisms for scientists researching the world's living aquatic resources. Access to over a million indexed charts, figures, graphs, maps, photographs, and tables from the scholarly research and technical literature. Social Sciences Abstracts Description of this database. The list below includes discipline/department names which may have been used to index theses. Discipline and department names often change, and the most recent names can be found on the University website.